Remember when your baby was content to sit, snuggled up in your arms, for hours on end? Remember how you said that you couldn't wait to see your sweet little one crawling and learning new things? Well, as that day draws near, it is important to prepare your house to assure the safety of your little explorer. Although babies vary as to when they are developmentally ready to crawl and climb, once they start, there is no stopping them. Babies are curious and anxious to explore their surroundings, which is a great way for them to learn. At the same time, parents must take a good look around to be sure that they are doing all of that learning in a safe way. Falls account for many serious injuries and even the deaths of babies each year. Since they are physically able to climb up on things well before they develop the common sense to be cautious and it is impossible to be with them every second, equipping your home with safety gates is a must. Typically, safety gates are used for two major purposes: to keep babies and young children safe from falling down stairs and to keep them away from other household dangers by sectioning off areas of the home that do not have traditional doors. Manufacturers of children's equipment have recognised the wide need for such products and offer a broad variety of gates to fit even very large or irregular shaped openings. Check out the range of safety gates at John Lewis. Depending on the desired location of the gate and whether or not it will be permanent, parents can choose models that screw into the woodwork or are merely held by pressure fittings. The screwed in varieties are more secure, so they should be used at the tops of all staircases. For less important areas, such as stairway bottoms or for sectioning off a room to keep babies near their parents, either variety will suffice. Pressure fitted gates are convenient and cost efficient as they can be moved for use in different areas of the house. While the safety of babies and young children is always the first consideration, most parents will agree that they'd prefer safety gates that are pleasing to the eye. Styles vary considerably, and although most gates on the market today are plastic, manufacturers have come a long way in producing products that blend well with most décor. Soft, neutral colours are widely available, and for a bit more money, there are a number of high quality wooden gates being produced. Since stair gates will probably be in use for several years, selecting one that is attractive is worth the extra money. Safety standards have tightened over the past years, so stair gates are items that are best purchased new. Also, the effectiveness of the gate is dependent on proper installation, so be sure to follow the manufacturer's instructions exactly. Remember, no gate is a substitution for responsible adult supervision, so never leave your baby unattended near any stairways, even those that are securely gated. No matter what type of safety gate you choose, none will work if you don't remember to keep it closed. Get into the habit of closing the gate every time you walk through so that you will have the peace of mind of knowing that your baby is safe. Also, though it can be tempting to simply step over the gate, never do so in the presence of young children and instruct older siblings to avoid stepping over the gate, too. 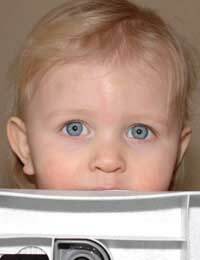 Babies learn by watching others, and you don't want to encourage them to attempt to scale the gate!